Prof. D. K. Gupta, Vice Chancellor, Chatrapati Sahuji Maharaj Medical University (CSMMU) delivering inaugural lecture. On dais is seen Prof. Jaishree Bogra, Head Anaesthesiology Dept, CSMMU, collaborator of the Symposium. The Vice Chancellor, CSMMU, Prof D. K. Gupta declared on 31st May, 2011, the “CSMMU as a smoke free and tobacco free university” on the occasion a symposium on “ WHO Framework Convention on Tobacco Control” jointly organised in collaboration with Cancer Aid Society, Lucknow. Cancer Aid society is active in the area on cancer awareness promotion, cancer advocacy and palliative care for over two decades. Prof Gupta while delivering his remarks as Chief Guest of the programme held in collaboration with Department of Anaesthesiology, Faculty of Dental Sciences (both from CSMMU) and Cancer Aid Society expressed great satisfaction about the work of Cancer Aid Society on promotion of harmful effects of tobacco in the society. He said Cancer Aid Society should have more like-minded people for the useful work by the Society. The declaration to make CSMMU smoke and tobacco free will make the campus healthy for the staff and patients. Prof Gupta also formally released the CAIDS’ inaugural issue of the newsletter ‘Stop-News’ focussing on theme of FCTC. Prof. D. K. Gupta (third from left) after clicking the release of quarterly E-newsletter, Stop-Cancer. Seen from left to right: Mr. O. P. Berry, Director General (CAIDS), Dr. D.P.Gupta, President (CAIDS). Dr Zaka Imam, Director, Corporate & International Affairs, & Editor, Stop-Cancer, (second from right) showing contents to Prof. D. K. Gupta. Ms.Safina Kidwai from CAIDS administration is seen on extreme right. Detailing the background of FCTC, Dr Imam said that India had played a leading role in development of FCTC and is among the earliest to ratify this treaty. Due to global success in developing the adequate machinery for control of tobacco use under FCTC, the WHO has designated the FCTC as the theme of “World No Tobacco Day-2011”. This symposium is therefore being observed on this theme. India is implementing FCTC by bringing in a powerful Cigarette & Other Tobacco Products Prohibition of Advertisement and Regulation of Trade and Commerce, Production, Supply and Distribution) Act-2003, in brief called COTPA. Government of India launched National Tobacco Control Programme in 2007-08 with a multipronged approach for effective tobacco control in the community. The programme is helping build state and district programme strategies and effectively implement anti-tobacco legislation, COTPA, in the country. The Cancer Aid Society President, Dr. D. P. Gupta gave in brief an account of work carried out by the Society over the last twenty four years in the area on cancer awareness, prevention, and control and cancer advocacy. Dr. Gupta said that the Society was working on Cancer Control by following WHO guidelines without any government financial support. The Society’s strategy was based on awareness and tobacco control campaign among children in pursuance of WHO views that school children can play effective role in cancer control. Over years Cancer Aid Society has made an army of school children for cancer control, who have been made aware of health and hygiene, and have acted as messengers to others. The CAIDs Public Private Participation (PPP) in Health Awareness and Education has led to notable success in the crusade of Cancer Control. Prof K. K. Wadhwani, Dean Faculty of Dental Sciences, in her talk on the occasion said that glamourous advertisements and celebrities shown smoking or using tobacco products lead to people consume tobacco. Oral cancers are one of the most common cancers, she said. 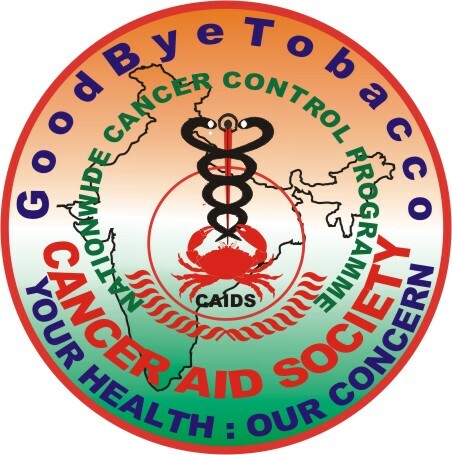 “People who are involved in the tobacco trade get cancer of tip of tongue because they taste the quality and contents of tobacco in the tobacco leaf supplied to them”, she said, “ People smoke, eat pan masala or chew tobacco and lime (surti) without even knowing or realizing the consequences.” Educated people even make lame excuses like greater concentration after tobacco use, she said. A free oral cancer detection camp was also organised at the OPD of Faculty of Dental Sciences, CSMMU. Prof. K. K. Wadhwani, Dean, Faculty of Dental Sciences, CSMMU (on right) one of the collaborators of the Symposium, while Prof D.K.Gupta, V.C, CSMMU declares the medical university tobacco free before the media. Other speakers who spoke on the occasion were Prof Jaycee Bora, Head, Anaesthesiology, CSMMU and Prof. A.K Tripathi, Department of Medicine Departments, CSMMU, and Prof Madhu Mati Goel, Dr Ajay Chaudhry, CSMMU and Dr Sudhir Siha, Scientist, CDRI, Lucknow. Dr A.K.tripathi said that in smoker’s drug metabolism is changed. As a result drugs will not have the same effect as in normal smokers. The smoking history is important to know in order to prescribe suitable drugs. Some type of drugs can even be harmful to smokers. The effects of aminophylline are enhanced while effects of diazepam, heparin, and insulin are subdued in smokers. A competition of oral presentations on the theme “Tobacco Abuse & Control” was held among medical students. Four students were given cash awards for oral presentations, by Cancer Aid Society. Shi O.P. Berry, Director General, Cancer Aid Society presented vote of thanks. He thanked the Vice Chancellor and the cooperation of Prof Jaishree Bogra and Prof K. K. Wadhwani in organising the Symposium in collaboration with the Cancer Aid Society, and all participants for their valuable time and support.